My interest in screenwriting, is, logically, rooted in the love of the feature film. I have known the power of a good film since I was young: the emotions it can take you through, the escapism it provides, the characters that become a part of your life. Knowing I would write this post, I have been trying to think about the first movie memory that I have. I originally believed it was a movie called Rollercoaster in 1977. I don’t remember much about the movie, except the thrill of the first person view of riding coasters and the speakers vibrating my seat and the floor of the theater. I vaguely remember the facade of that theater, which was still standing when I moved away from Colorado Springs in 1989. Searching the Internet I don’t immediately find an image or name that sounds right, but I will ask around to see if I can find and add that info here. I also remember, at that same theater, waiting in line with my family for a much more recognizable title – Star Wars. Rollercoaster was out just a few weeks later, so it must have been Star Wars that was my first memorable theater visit. And reminiscing brought up many other memories of movies while I was growing up. The next year, my first memory of a drive-in theater was made. I recall my sister and I trying to go to sleep in the back seat of a car, while my parents watched FM. Another vivid memory is that of being introduced to my Dad’s cousin’s awesome theater room – they had an amazing sound system, projector TV and a Laser Disc player. We watched Sgt. Pepper’s Lonely Hearts Club Band (1978). The Shining (1980) can’t be skipped; it was the first scary movie I ever watched and I was brilliant enough to watch it at home, alone, at night, when I was 12. I don’t think I slept for a week. That would pretty much be the story for the rest of my life – I can’t do horror flicks. I’m so impressionable, that the little black subway ghosts from Ghost (1990) gave me nightmares for weeks!! The only movie I’ve brought myself to watch – for reasons that escape me – was the Blair Witch Project (1999). I can’t even stand previews of scary movies or TV drama. I have to close my eyes and plug my ears. Flash forward to 1983, past Close Encounters of the Third Kind (1977), Slap Shot (1977), Caddy Shack (1980), another chapter in the Star Wars story (1980), and ET (1982). War Games – this movie really captured my attention. I felt like I was David (I wasn’t even close). I had my own computer (Vic20) and peripherals (tape disk drive, four-color plotter/printer) that I had saved for and purchased on my own. I had the little programming magazines and would type in programs. I felt different and smarter than others and knew I loved working with computers. I still recall going to some career fair and coming home clutching a Broderbund brochure. Very few movies hold a permanent place in my heart, and this is a big one! After my Dad finally created his own home theater in our family room, with a big screen TV and a Laser Disc player, anyone that came to our house would be required to sit through a demo of the really loud parts of Close Encounters of the Third Kind (1977) – I have the scene with the mailboxes shaking permanently burned into my brain) – and the hockey scene from Strange Brew (1983). I remember my parents also really loving the Woody Allen film, Sleeper (1973), but I never really understood it, and in fact, I have just never been a big Woody Allen fan. The Right Stuff (1983), Space Camp and Top Gun (both of 1986) would be the biggest memories after that. My love of the space program was in place from the start of the shuttle program, and was far from dampened by the shuttle tragedy; and, well, how could a 15-year-old girl not fall in love with Maverick and Ice Man. Volleyball, anyone? Into the 90s, I favored drama and romance flicks. I would readily purchase VHS tapes, and later DVDs, of movies I wanted to watch over and over again. I’ll highlight those in an upcoming post. I remember being really moved by Forrest Gump (1994) and other dramas around the time. I also loved the asynchronous Pulp Fiction (1994). By now, I have become fairly partial to romantic comedies. I love laughing, I love happily-ever-afters, and if I’m going to escape the drama of my own life, I want to laugh and dream of how-it-could-be. And while romantic comedies are my favorite genre, it was my fascination with the remake of Ocean’s Eleven (2001) that drew me to screenplays. 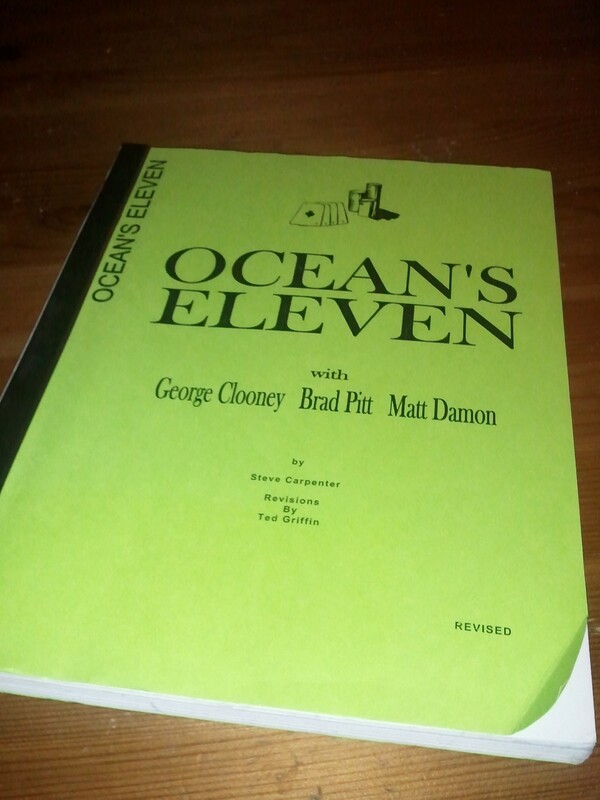 A little comic book shop in the Pike Place Market stocks printed copies of screen plays, and one day in 2003, after thumbing through the selections, there was no question that I would purchase the script for Ocean’s Eleven. I wanted to see how the story weaved together in print. That is without a doubt when my love affair with scripts began! I loved the format, the focus on dialogue, the scene intros – everything. Over the next few years that followed, I purchased a half dozen more from that same shop. I found others in book format and many in digital format. In a future post I’ll detail those that I’ve really read and analyzed, as well as what motivated to write one on my own.